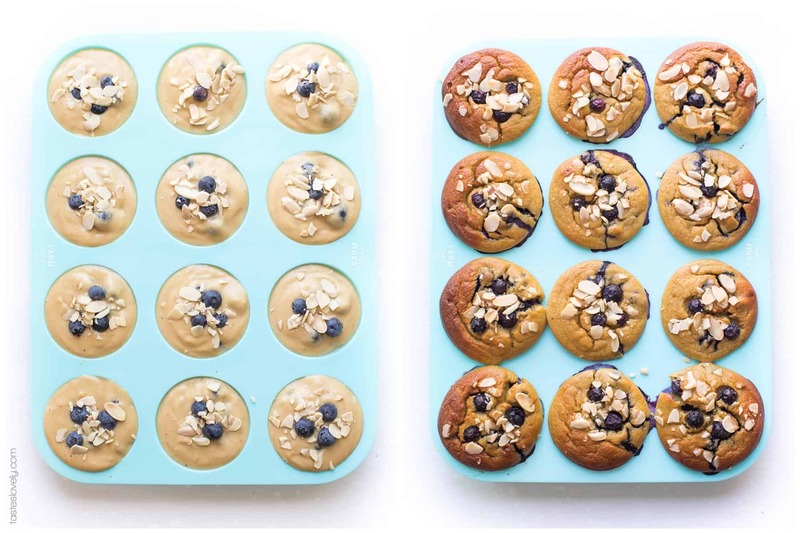 Paleo Blueberry Muffins – made with almond flour and sweetened with banana and coconut sugar. The batter is made in the blender! Gluten free, grain free, dairy free, refined sugar free, soy free, clean eating, real food. 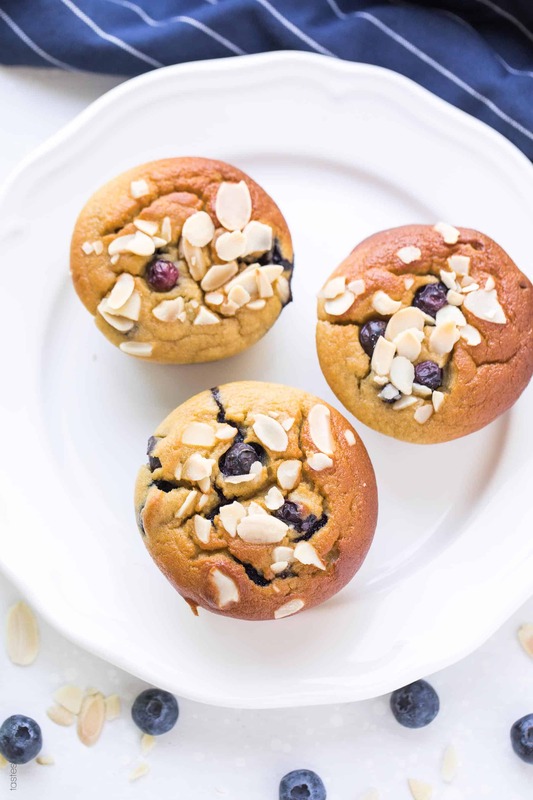 These paleo blueberry muffins are so amazing! I am too excited to share them with you! 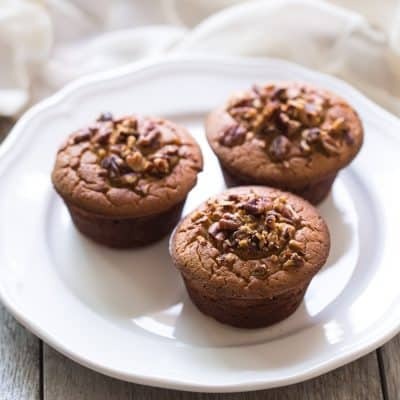 You’ve all been loving my paleo banana muffins so much, I get multiple emails a week from you guys saying how much you and your family are enjoying them. So I know you’re going to love this blueberry muffin version. My sweet, sweet husband leaves for work very early in the morning. I rarely even hear him get up. 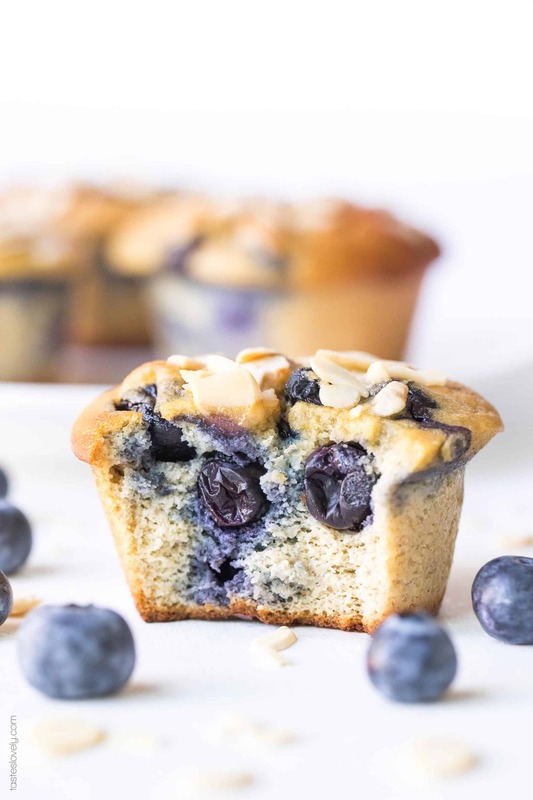 I love to have a healthy breakfast he can grab on the go, and these paleo blueberry muffins have been perfect! 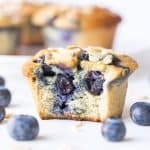 Just like my paleo banana muffins, these paleo blueberry muffins are made in the blender, so they come together in a snap. They are made with almond flour, which adds in tons of protein to the muffins. 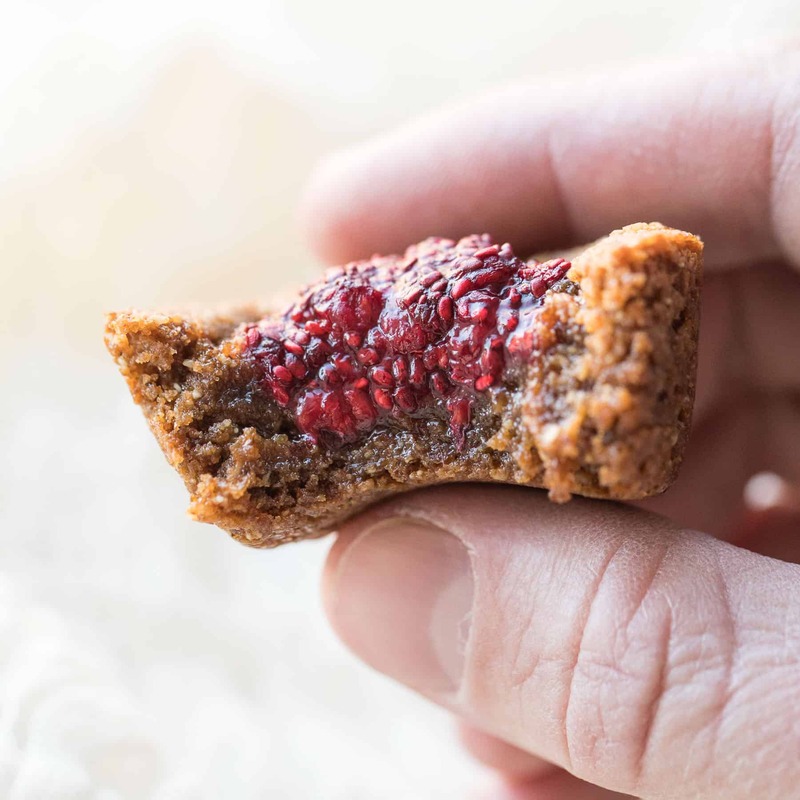 They are sweetened with bananas and coconut sugar, and have other great and healthy ingredients like coconut oil and eggs. Each muffin has half an egg in it! And of course, lots of juicy, fresh blueberries which are so delicious this time of year. 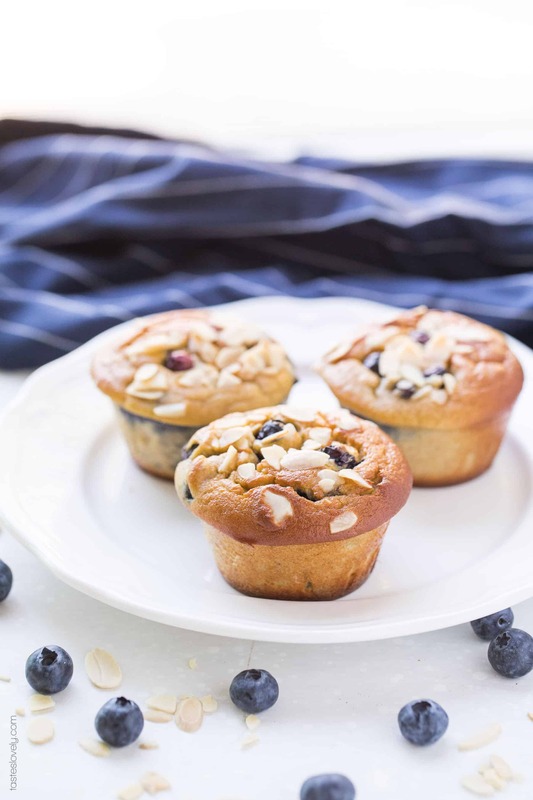 I top my paleo blueberry muffins with a sprinkling of sliced almonds, just to add a little more crunch on top. I prefer skipping muffin liners, and using a nonstick silicone muffin pan instead. I don’t want to waste any of the muffin that gets stuck to the paper liner! Plus, I think they look so much prettier without muffin liners. But feel free to use muffin liners if that’s easier for you. These muffins keep for at least 5 days in an airtight container, perfect for a work weeks worth of grab-and-go breakfasts. My 2.5 year old loves eating these too! And I love feeding them to my family since they’re so dang healthy! Paleo, gluten free, grain free, dairy free, refined sugar free, soy free, packed with protein, real food, clean eating. Preheat your oven to 350 degrees with the oven rack in the middle. Pour the batter into the muffin pan, filling each muffin to the top. Sprinkle about 1 teaspoon of the chopped sliced almonds on top of each muffin. Bake for about 40 minutes, until the tops are golden brown. 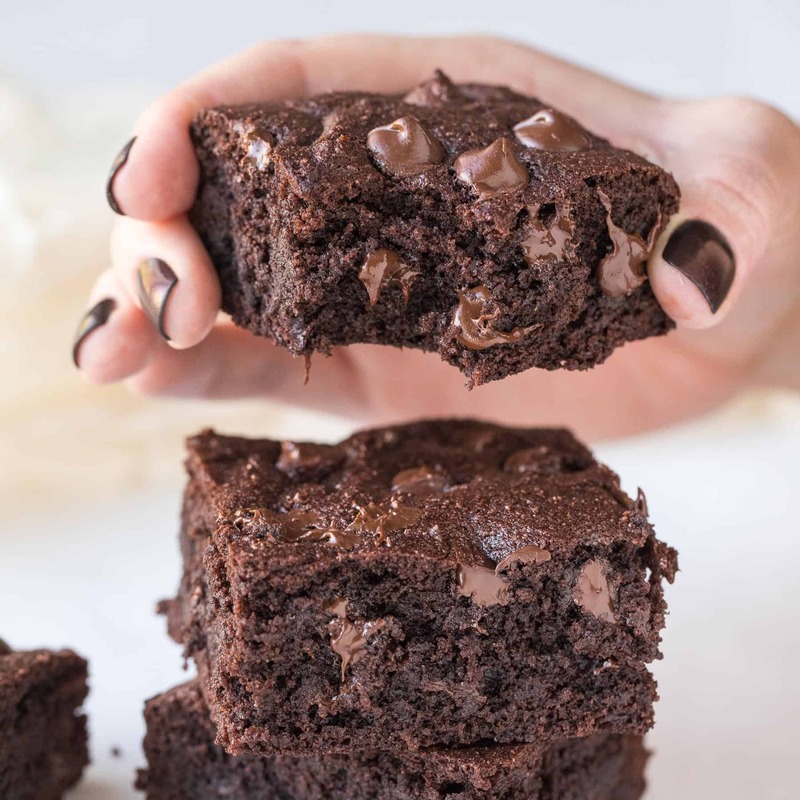 Allow to cool, remove from the muffin pan and enjoy! Muffins will last 5 days in an airtight container, or frozen for 1 year. See notes for freezing instructions. You don’t want to use bananas that are completely brown. They have too much moisture in them and the muffins will turn out too wet and flat. The perfect banana to use is yellow with small brown freckles. These freeze beautifully! Allow the muffins to cool completely, then wrap tightly in saran wrap and store in a freezer safe ziptop bag. You can use frozen blueberries if you can’t get your hands on great fresh ones. Use the berries as they’re completely frozen, don’t thaw them first since they get runny and will stain the batter. 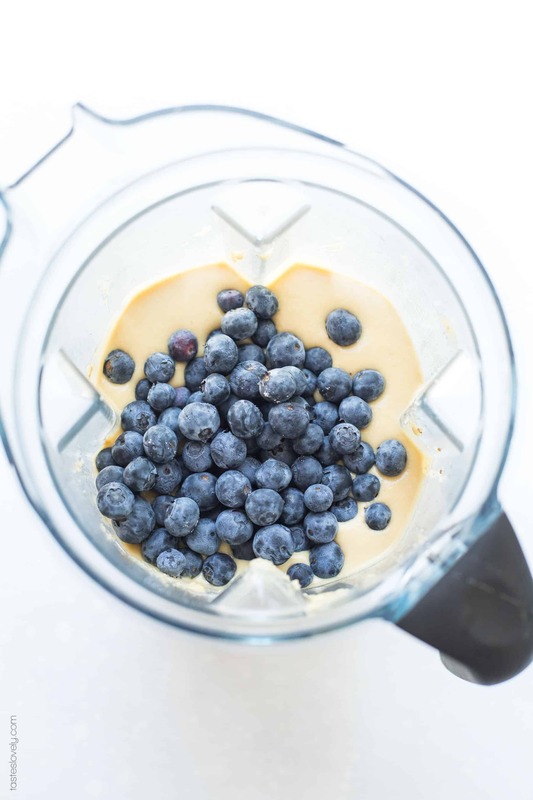 I like to toss the frozen blueberries in a little bit of the almond flour first before mixing them in. 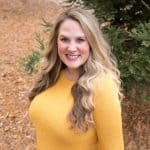 So glad you liked them Brittany! Thanks for taking the time to let me know you liked my recipe. Means the world!